Q. What does the phrase “Orthodox Judaism” mean? A. What separates orthodoxy from non-orthodoxy is their attitude to halachah. Orthodoxy stands for and upon halachah: non-orthodoxy gives it a vote but not a veto. Halachah sees Judaism as the path on which one should walk. That path derives from Torah, which covers the whole of life. 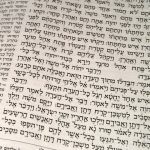 The source and authority of the Torah is God, who empowered each generation’s teachers to interpret and apply the written text. This is done in the Talmud and the range of rabbinic literature. Some rabbis were mystics, others rationalists. Some were prosaic, others poetic. All were committed to living halachically, though there were secessionist movements like the Karaites and, from the 19th century, Reform. The 19th century also saw the rise of Historical Judaism, more or less the same as American Conservatism, which is not quite Orthodox, not quite Reform. Today orthodoxy is growing, with increased levels of Jewish learning and observance. Its concern extends to professional and commercial ethics, intellectual property and scientific truth – in short, everywhere. This entry is filed under Ask The Rabbi, Defining Jews & Judaism. WordPress generated this page with 31 queries, in 0.204 seconds.